Please Come Flying: Songs of the Civil War Era Grant! Thanks to a generous grant from the Senter Fund, I'll be returning to the Brunswick School District this spring! I'm looking forward to teaching my Songs of the Civil War Era workshop to a whole new batch of 5th graders. I'll give four school performances, teach a workshop on songwriting, and participate in a Civil War Reenactment run by the fifth grade class. Last year, the Brunswick students wrote "class verses" to two popular Civil War songs. 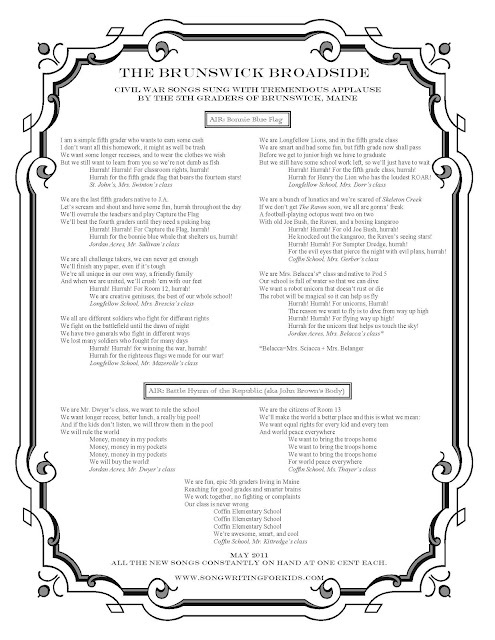 We recorded the verses and created an 1800's style broadside (click on the image below to see a larger image, or check it out at the Songwriting for Kids website). I'm so excited to be back in the classroom again this year!